Crush It! 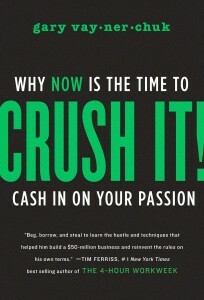 Why Now Is the Time to Cash In on Your Passion, by Gary Vaynerchuk, HarperStudio, 2009. As a case study in how social media can revolutionize business and create whole new careers, there are few better examples than Gary Vaynerchuk. A wine merchant by trade, he became a new-media icon after starting a daily video series to talk about wine. His new book, Crush It!, argues that virtually anyone can replicate his success, given the right mixture of passion and hard work. Superficially, at least, Crush It! is a fairly standard business book of inspirational encouragement and practical advice. Like The 4-Hour Workweek, which it somewhat resembles, Crush It! draws from the author’s life and business experiences for much of its content. At 160 not-very-dense pages, the book is a quick read and may feel a bit disappointing at first. But for me, at least, it repays second and third readings. Although Gary Vee, as he’s known to his fans, makes efforts to direct at least some of the advice in his book to established businesses, his real target lies elsewhere. He is speaking for the most part to early-stage and wannabe entrepreneurs, to disaffected or unemployed workers, and to other individuals who may be contemplating striking out on their own. The Internet is cool, and it is easy to mistake coolness for goodness. So for every few new-media optimists I read, I like to pause for a quick a dose of counterbalancing pessimism. The latest dose for me comes from Farhad Manjoo’s True Enough: Learning to Live in a Post-Fact Society. Manjoo is the technology columnist for Slate magazine and, I infer, an Internet enthusiast. His book, however, is not as much about the new media per se as it is about the interaction of new media with the psychology of belief. When Jarvis writes in an early chapter of WWGD, “the link changes every business and institution,” it may sound a bit portentous. But he has it exactly right. The first time I encountered a hyperlinked Web page, back in the early 1990’s, I thought it was just a lame version of Gopher–a now largely forgotten way of finding various documents around the Internet. What I didn’t get at first was that the innovation was not in the links themselves, but the enormously powerful relationship of those links to the document in which they are embedded. The link, the ability to take readers directly to other sources of information, has revolutionized publishing and journalism. No longer is a document by necessity a hermetically sealed, constraining vessel. And no longer do you need to provide all the background details and related information yourself. Links are liberating for journalists and publishers alike.